Consumption of combinations of herbs, such as those listed here, have been resulted in hearing clinical reports of driving herpes into “permanent remission,” greatly reduce symptoms associated with the common cold & pneumonia, eliminating/minimizing cold sores, help those with various forms of hepatitis, and otherwise cope with viruses. These herbs are generally not recommended for pregnant nor lactating women nor infants. Angelica Bai zhi: In traditional Chinese medicine it is believed to “expel wind-cold, alleviate pain – supraorbital pain, congestion, toothache -clears swelling, expel pus – early stage, carbuncles, sores, ulcer -expel dampness – leucorrhea -opens nasal passages for nasal congestion” . Because of its abortive potential, etc. it is not advised during pregnancy. One study found that a version of it “exhibited some anti-HIV activity” . One of its components has been found to have a “synergistic effect with Combivir” , an anti-AIDS drug. Bupleurum Chai hui: “Saikosaponins, the main active constituents of Bupleurum spp., have been shown to possess immunomodulatory, hepatoprotective, anti-tumor and anti-viral activities… saikosaponin c exhibits anti-HBV activity” . WebMD states, “Bupleurum is used for respiratory infections, including the flu (influenza), swine flu, the common cold, bronchitis, and pneumonia; and symptoms of these infections, including fever and cough” . Based upon its effects on the H1N1 virus, one study concluded that an extract could “be developed as an antivirus agent” . One variety was found to possess anti-viral effects against the coxsackie B virus type 1 . 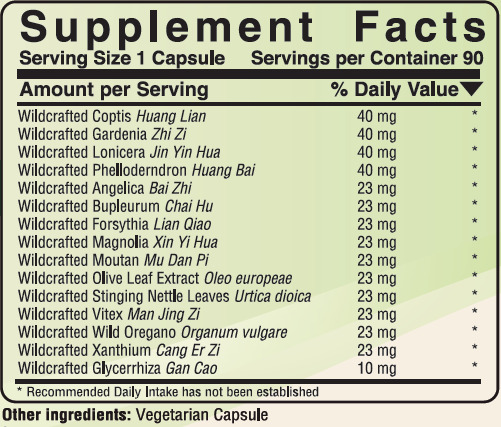 Coptis Huang Lian: “Coptis is a small, perennial herb found in North America, Greenland, Iceland and Siberia… Coptis was originally used by Native Americans to treat canker sores and mouth sores. In traditional Chinese medicine, it is used for gastrointestinal problems, diarrhea, hypertension, and bacterial infections. The plant’s roots contain berberine, which can be used as an anti-inflammatory and antibacterial, and berberine-like alkaloids which are believed to facilitate healing” . It is sometimes called Canker root. Coptis has been found to have protective anti-viral effects on cells . It also appears to have inhibitory effects on certain viruses [9,10]. One study reported that it reduced inflammation of the colon . Forsythia Lian qiao: Forsythia has been found to work “by indirectly suppressing the virus proliferation via regulating the immune systems in hosts, and also, by directly inhibiting virus proliferation through targeting viral proteins essential for the viral life cycle” . It contains a substance which “inhibits the avian infectious bronchitis virus” at least in vitro . It also contains a substance that was found to have anti-respiratory syncytial virus replication effects in vitro . Gardenia Zhi zi: “According to the principles of traditional Chinese medicine, gardenia …purges heat; dispels damp heat; disperses fire; and cools blood” . One study found that gardenia had the most protective anti-viral effects on cells of various herbs tested . One study found that components of it had moderate inhibitory affects against the H1N1 virus . Gardenia has been found to have many substances that may contribute to its anti-influenza properties . Another study found that at least one of its components had protective effects on cells exposed to an influenza-type virus . An animal study concluded that at least one of its components may exert an inhibition effect of viral replication on herpes . Another animal study found that “six kinds of viruses were inhibited significantly…influenza viral pneumonia” . “Gardenia jasminoids Ellis (Rubiaceae), and has been widely used to treat acute hepatitis with jaundice” and in combination with other herbs has been found to protect cells from viral infection as well as “to inhibit infections by HSV-1 and HSV-2 and this effect was likely mediated through direct inactivation of the virus infectivity” . Gardenia also contains a carotenoid called c rocetin which has been found to prevent retinal damage in vitro and in vivo . Glycerrhiza Gan cao: Is also known as licorice. WebMD reports, “Licorice is used for various digestive system complaints including stomach ulcers, heartburn, colic, and ongoing inflammation of the lining of the stomach (chronic gastritis). Some people use licorice for sore throat, bronchitis, cough, and infections caused by bacteria or viruses” . Licorice, even “low appropriate doses, anti-inflammatory, anti-diabetic, antioxidant, anti-tumor, antimicrobial and anti-viral properties have been reported by researchers worldwide” . Various forms have been found to be “effective against HRSV infection on airway epithelial cells. Radix Glycyrrhizae inhibited HRSV mainly by preventing viral attachment, internalization, and by stimulating IFN secretion” . Lonicera Jin yin hua: Is also known as honeysuckle. WebMD states, “Honeysuckle is used for digestive disorders including pain and swelling (inflammation) of the small intestine (enteritis) and dysentery; upper respiratory tract infections including colds, influenza, swine flu, and pneumonia; other viral and bacterial infections; swelling of the brain (encephalitis); fever; boils; and sores. Honeysuckle is also used for urinary disorders, headache, diabetes, rheumatoid arthritis, and cancer. Some people use it to promote sweating, as a laxative, to counteract poisoning, and for birth control” . Lonicera has been found to work “by indirectly suppressing the virus proliferation via regulating the immune systems in hosts, and also, by directly inhibiting virus proliferation through targeting viral proteins essential for the viral life cycle” . Components seem to have anti-influenza virus effects . Lonicera has at least one component that have been found to be effective in inhibiting chronic hepatitis C virus infection . Magnolia Xin yi hua: “In traditional Chinese medicine, magnolia flower has pungent and warm properties, and is associated with the Lung and Stomach meridians. Magnolia flower is typically used to treat nasal conditions, such as stuffy nose, nasal obstructions, congestion, and sinus headaches” . A substance contained in magnolia has “been shown to inhibit hepatitis C virus (HCV) infection in vitro...It… inhibits HCV infection by targeting cell entry and replication” . Moutan Mu dan pi: Also known as peony. One study concluded that a peony extract “could be beneficial at preventing HRSV infection by inhibiting viral attachment, internalization, and stimulating IFN secretion” (Human Respiratory Syncytial Virus) . One or more substances in its root is believed to be an effective agent against the hepatitis B virus . One study of herbs found that peony was amongst those that “possess the strongest anti-Coxsackie virus B3 activity on viral replication” . Related to herpes simplex, an “extract of Paeonia suffruticosa prevented the process of virus attachment and penetration” . Olive Leaf Oleo europaea: Olive leaf extract (OLE) “inhibits acute infection and cell-to-cell transmission of HIV-1 as assayed by syncytia formation using uninfected MT2 cells co-cultured with HIV-1-infected H9 T lymphocytes. OLE also inhibits HIV-1 replication as assayed by p24 expression in infected H9 cells. These anti-HIV effects of OLE are dose dependent, with EC(50)s of around 0.2 microg/ml. In the effective dose range, no cytotoxicity on uninfected target cells was detected” . “The antimicrobial potential of eight phenolic compounds isolated from olive cake was tested against the growth of Escherichia coli, Klebsiella pneumoniae, Bacillus cereus, Aspergillus flavus and Aspergillus parasiticus. The phenolic compounds included p-hydroxy benzoic, vanillic, caffeic, protocatechuic, syringic, and p-coumaric acids, oleuropein and quercetin. Caffeic and protocatechuic acids (0.3 mg/ml) inhibited the growth of E. coli and K. pneumoniae. The same compounds apart from syringic acid (0.5 mg/ml) completely inhibited the growth of B. cereus. Oleuropein, and p-hydroxy benzoic, vanillic and p-coumaric acids (0.4 mg/ml) completely inhibited the growth of E. coli, K. pneumoniae and B. cereus. Vanillic and caffeic acids (0.2 mg/ml) completely inhibited the growth and aflatoxin production by both A. flavus and A. parasiticus, whereas the complete inhibition of the moulds was attained with 0.3 mg/ml p-hydroxy benzoic, protocatechuic, syringic, and p-coumaric acids and quercetin” . Research has concluded that oleuropein “showed significant antiviral activities against” respiratory syncytial virus and parainfluenza type 3 virus”  and “can possess antibacterial action” . It is believed that oleuropein from olive leaves is converted into elenolic acid in the body—elenolic compounds are believed to have “a killer effect against many viruses, bacteria and other microbes” . “Upjohn found that one of the ingredients of olive leaf extract, calcium elenolate, destroyed every harmful virus, bacteria, yeast, fungi and protozoan it was exposed to in vitro,” but that it lasted only minutes in vivo —that is one of the reasons why concentrated olive leaf Food should be better for humans than any of its isolated components. Phellodendrum Huang bai: “The name "huang bai" comes from the bright yellow color of the plant's inner bark, which is used in herbal preparations… In traditional Chinese medicine, phellodendron bark is considered to have bitter and cold properties, and is associated with the Kidney and Bladder meridians. Its main functions are to drain damp heat and kidney fire. Among the conditions it is used to treat are diarrhea, dysentery, swollen joints in the legs, and jaundice. Phellodendron bark is often used in conjunction with other herbs” . Phellodendrum has been found to have “antiviral activity on herpes simplex virus” . 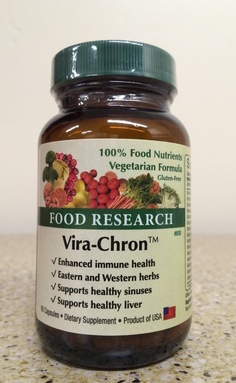 An extract was found to have anti-coronaviral effects . Stinging Nettle Urtica dioica: It has been used to support healthy lungs and sinuses [35,43]. “A study concerning a lectin present found in nettle suggest a potent and selective inhibitor for HIV and cytomegalovirus replication” . Vitex Man jing zi: Also known as chaste tree. “Chaste tree is reportedly effective in treating endocrine disorders” . Extracts have exerted “intracellular antiviral activity” and ” inhibited virus propagation” . Wild Oregano Origanum vulgare: The PDR for Herbal Medicines states that its “essential oil, which contains carvacrol, is antimicrobial in vitro” and that “Oregano herb is used for respiratory disorders such as coughs, inflammation of the mucous membranes, and as an expectorant…In China, Oregano is used for colds, fevers, vomiting, dysentary, jaundice, and malnutrition for children” . “Origanum oil…possesses a broad spectrum of in vitro antimicrobial activities attributed to the high content of phenolic derivatives such as carvacrol and thymol…Using Candida albicans in broth cultures and a micro dilution method, comparative efficacy of origanum oil…in vitro. Origanum oil at 0.25 mg/ml was found to completely inhibit the growth of C. albicans in culture…mice fed origanum oil exhibited cosmetically better clinical appearance compared to those cured with carvacrol. The results from our study encourage examination of the efficacy of origanum oil in other forms of systemic and superficial fungal infections and exploration of its broad spectrum effect against other pathogenic manifestations including malignancy,” especially with an olive extract . Xanthium Cang er zi: “In traditional Chinese medicine, it is used to dispel wind and damp, and is one of the most important herbs used for sinus congestion, chronic nasal obstructions and discharges, and respiratory allergies” . Xanthium components have been found to have antibacterial and cytotoxic properties . Yang T, Jia M, Yue Z, Cheng Y, Zhang X, Huang J, Zhou S, Mei Q. Synergistic antivirus effect of combined administration of Combivir with Angelica polysaccharide sulfate. Int J Biol Macromol. 2013 Feb;53:122-6.